very quick delivery price good and will know more over the next few weeks as to preformance as motorbike is not yet on the road but monitoring at moment in garage. All fine- delivered promptly and just as expected. Very good price seems perfect well pakaged next day delivery what more to say excellent keep up the good work many thanks. Bill. Arrived promptly, plenty of oomph to turn over my Triumph Thunderbird 1700 LT once I put it on trickle charge for 8 hours. The battery was about 2-3mm slimmer than the one it replaced, but no problem. Fantastic Service and best price available. Excellent service. Perfect fit. Does what it should. 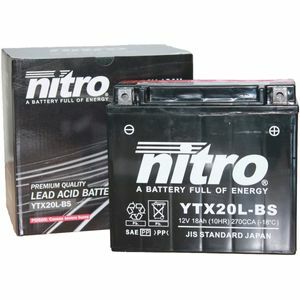 Excellent quality battery, delivered extremely quickly! Superb service and fast delivery. First class service and product worked first time.